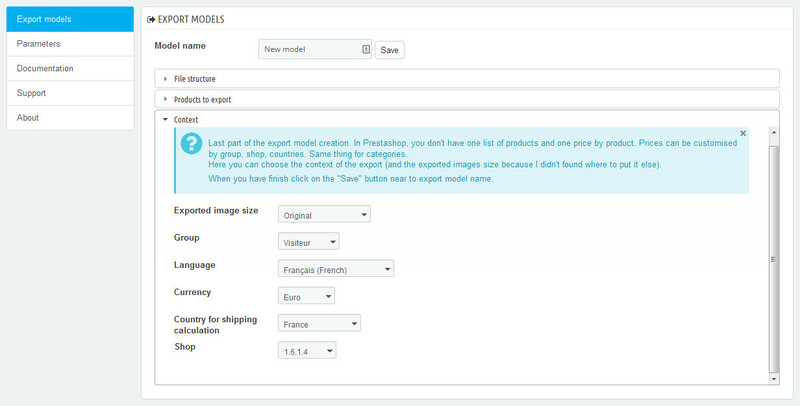 This Prestashop module offers a polyvalent tool for exporting your catalog. Manually or automatically you can generate something around the size of your catalog file exploitable . 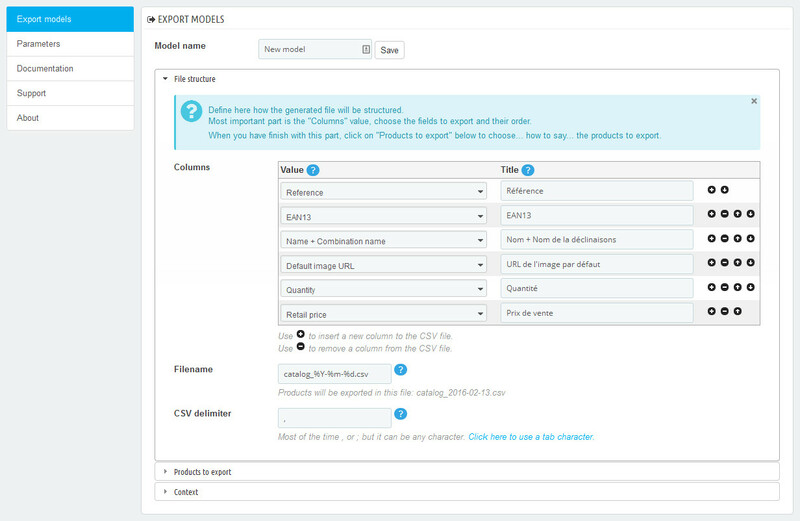 The catalog CSV export is almost an indispensable tool for the management of your shop. It allows you for example to check your inventory in Excel or any other spreadsheet. But not only. Keeping track of your stocks. You can receive regular email for your stock or archive to validate your actual stock . The price comparisons. Most support CSV files to update the pricing and availability of your products. Marketplaces. In the same way that the price comparisons, you can provide the URL of your catalog in CSV format they will pick regularly to update your data. The drop-shipping. Give your dealer a URL so they can update their catalog. The downloadable file is updated automatically. You can also create multiple files for each group of retailers for example, or for each country. Export your catalog to a stock management software, a store management software or another shop engine. All of them or almost manage files in CSV format. Export your catalog to another shop ( Prestashop , Magento, Thelia , Opencart … ). Almost all shop engines have an import product to CSV tool. 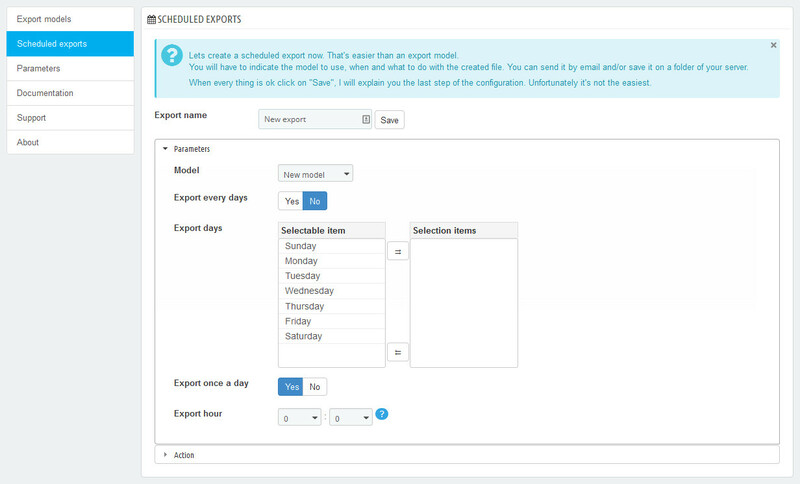 This module allows you to export manually or automatically ( fixed days and hours ) all or part of your catalog. 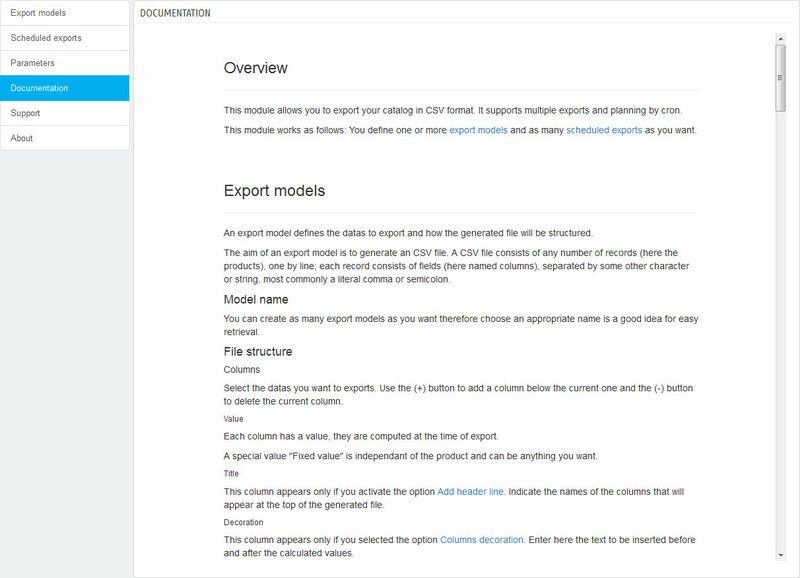 You can define as many export models as you want. The information to be exported among many opportunities. There is no limit on the number of columns to be generated. The products to be exported. 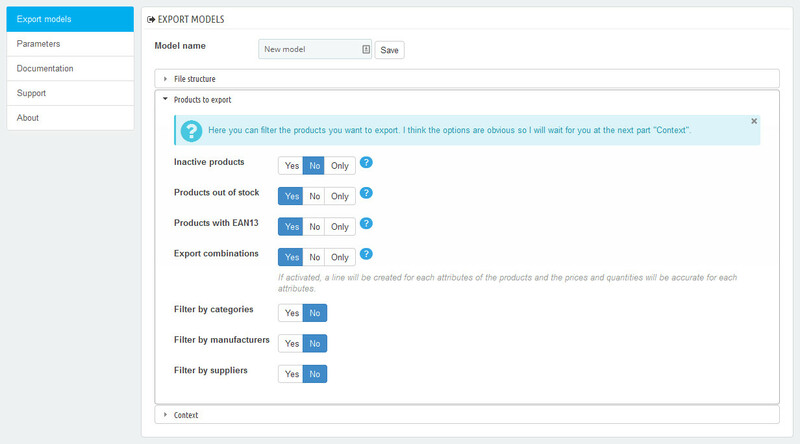 It is possible to export or not, attributes, out of stock products and/or inactive ones, and filter by categories, suppliers and/or manufacturers. A model allows you to generate a CSV file. This one can be generated manually to download it directly to your computer, or automatically to be sent by email or saved on your server. In the latter case, the CSV file can be downloaded via a URL that you can provide to a price comparison, a marketplace or a reseller for example. The file will be automatically updated. You can define as many programmed export model as you want. For each you choose the day of the week and time of export. Documentation of this module is integrated into its configuration page. You can access without leaving your administration panel. 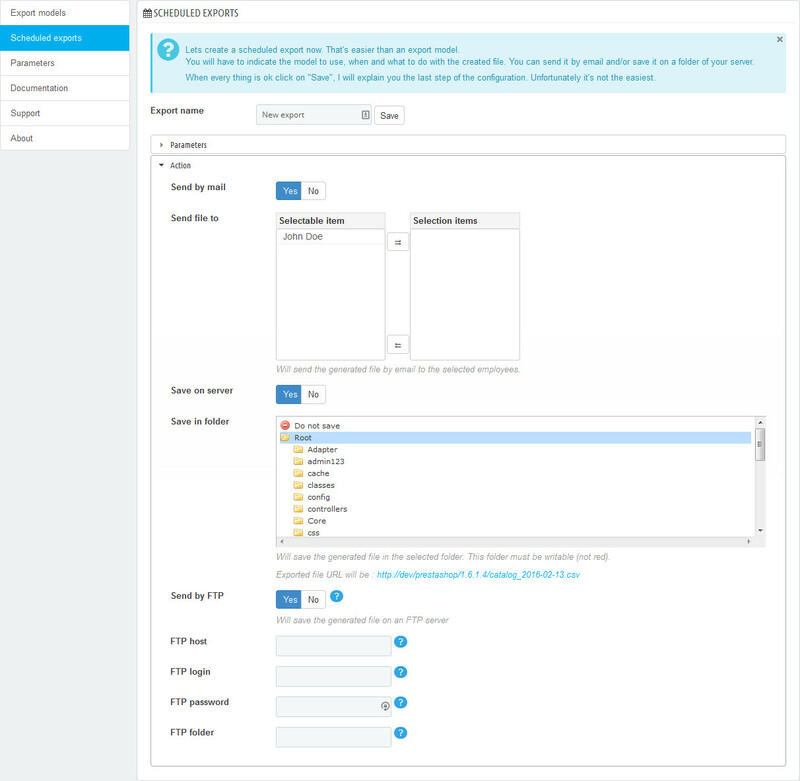 A ticketing system is integrated in the module and allows you to put your questions to the developer and read the answers without leaving your administration panel. This support is provided for free for registered modules. 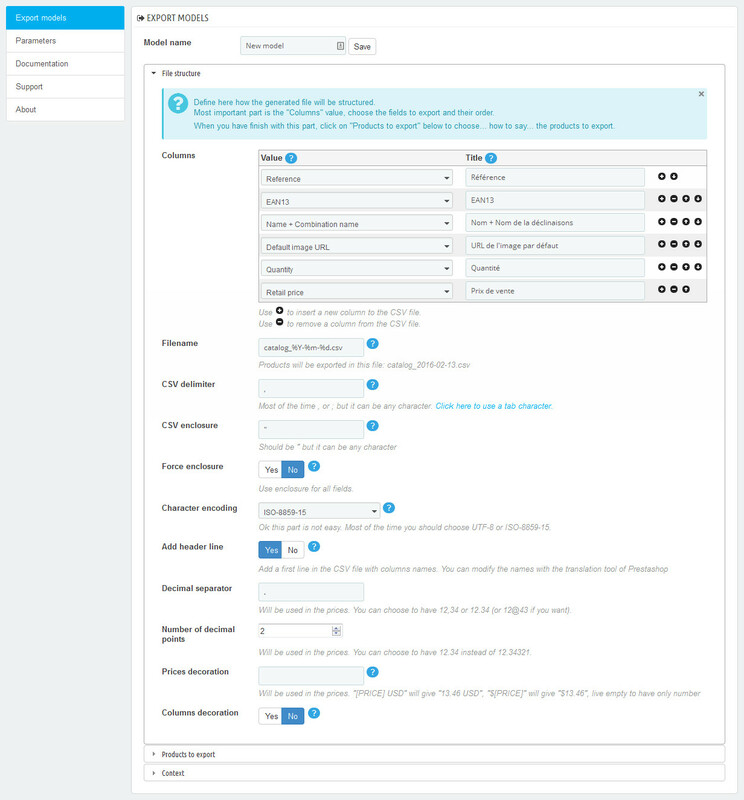 This is free and can be made from the admin panel of Prestashop.